OMG!! Has it really been a month already since we last spoke and the release of our NEW 2015 Vertilux Blind Fabric Range. And from your feedback, you are loving it!! We are really pleased. Our revamped website has been running well, with only a few glitches in the first week. This was to be expected and most were anticipated as you would with such a major change as this was. Please keep us informed of any issues, so we can address them quickly for you. This month, as we launch into beautiful Spring tomorrow, we talk a little about our Jewel, the latest in our Mottura by Vertilux collection, we have an update on Vertical colours, Members Info and a Price reduction and more. So please read on to find all our August new. PS: A very Happy Fathers Day to all those fathers out there for next Sunday 6 September. Many of our new fabrics sit well with the current design and décor direction that the 2015 discerning buyer expects. These new fabrics show off their range of neutral colours, glamorous greys, bronze hues, and a little sparkle as well. However, none of our fabrics meet this expectation as well as Jewel Translucent and Room Darkening. We have woven a silver thread through the fabric to give such a beautiful sparkle, truly lovely as the light touches it. Whilst there are only 3 colours to select from in each of the opacities, the 3 colours must be seen to be really appreciated, particularly the Room Darkening. We have been busily selecting the best of the best, for the Australian market, from Italian manufacturer Mottura, arguably one of the leading manufacturers of curtain track systems. After receiving your feedback, we have now completed the selection of tracks that will make up our exclusive range of Mottura by Vertilux systems, with the addition of EGO 480. 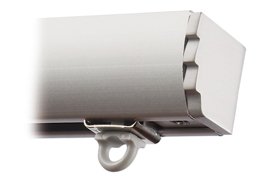 EGO 480 completes our range of manual, motorised and healthcare curtain tracks. The EGO 480 has the feature of being double-faced as both sides can be installed to show the flat or curved aesthetic effect. For use with curtains 600cm width max. and 300cm height, weighing up to 6kg. We have a complete range of brochures and data sheets ready to download. As we go forward we can’t stress enough that we want to make our website an easy tool to use and work within – both for you and as you work with your customers. Have you utilised the Blind Fabric filtering tool yet? 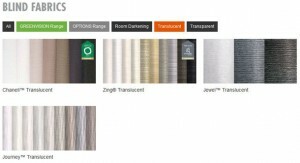 This will help quickly show the fabrics that you are looking for under filters such as: our Greenvision range; Options range; Translucent, Transparent or Room Darkening. See image on top left, this is just a snip of the full range of fabrics to select from. 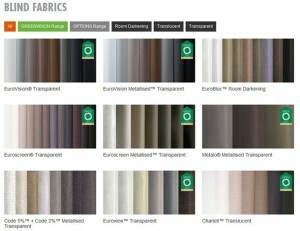 The image below shows the fabrics that are available when you check the ‘Translucent’ tab. That tab then highlights in orange to tell you which tab you are in. Happy clicking…and don’t forget to let us know what other features you would like to see. We have lots more coming your way over the next few months, so we could be working on just the item that you would wish for, to make your work day easier. As you will be aware, when you are checking your orders and wanting to track them as they make their way to you, you click on the ‘View your Recent Despatches’ link and go to the information under ‘Connote’. For those that are interstate, you can click on the consignment note number and it will take you directly through to our freight companies website – Direct Freight, to check on its progress. The best time to do this is after 4.30pm (VIC time zone). The orders, as they are being packed throughout the day, will not show the consignment number on the website until after 4.30pm (VIC time zone), when we upload to the Direct Freight website. So please check back after that time or first thing in the morning and those goods that have been despatched will have their consignment number in place ready to click on. We are also pleased to respond to your request to extend the current listing of 7 actual days of despatches to 14 days. This will go live in the next few days. 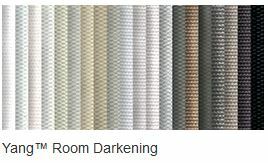 We can now confirm that the 9 new colours in Yang Room Darkening, released with the 2015 Retail Case Range, will be available on the Vertical Blind Systems. As the Vertical Fabric Range is currently undergoing a review and upgrade, for release in early 2016, we will not be sampling these 9 new colours into your Vertical Sampler Book. We ask that you use your Yang Mini Sampler or your Retail Case Sampler to show those new colours for your customers’ consideration. 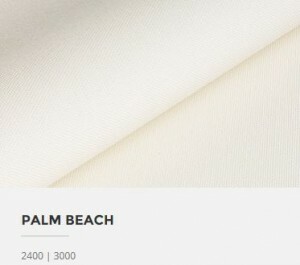 Due to some well negotiated discussions our Purchasing Department has arranged for the supply price to be reduced on both the Blockout and Light Filtering for the Palm Beach range of fabrics. Effective immediately, both Blockout and Light Filtering will be – Roller Price Group 4 (down from Price Group 7 + 5) and Roman Blind and Panel Glide Price Group 1. You asked for it and we deliver! 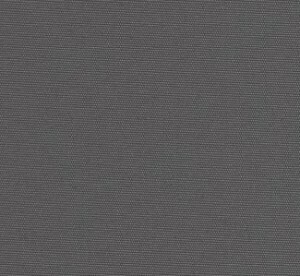 We released Madison Two with the new colour Knight, but only with Grey Backing. You have told us that you also want the standard White Backing to be included into the range. So indeed, that is what we will have in stock for you soon. Stock has been ordered and should arrive around the second week of September. Once stock arrives we will get it off to sampling so that you can add it into your brand new Retail Case Samplers. So feel free to order it now, but please keep in mind that we are awaiting stock to arrive. 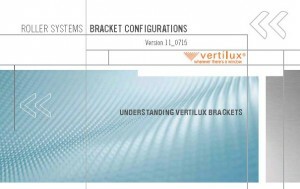 Late in July we issued a new Bracket Configuration Book update. So please check that you have downloaded it from the Member area: V11_0715 or below. Also, great news, we are currently working on the reprint of this oh so handy little book. You will hear more on that by next month’s newsletter which should announce that the new print version is available and ready to order.